Market Hero Review (Alex Becker) - Is Market Hero a Scam? In this Market Hero review, I’m going to reveal some email marketing secrets that are so good, you’ll want to crawl buck-naked across broken glass just to find them. But first, I want to say “thank you” to Alex Becker, the founder of Market Hero. I started watching Alex Becker’s YouTube videos back in 2016. He taught me a bunch of stuff about entrepreneurship, online marketing, and how to run a Shopify store. It was right around that time that Alex released his book, The 10 Pillars of Wealth: Mind-Sets of The World’s Richest People. I got that book as soon as I saw it and I proceeded to highlight it and mark it up with notes. In fact, I might go re-read it as soon as I finish this. Actually, Market Hero isn’t even his only multi-million dollar company. He also founded the SEO software development company Source Wave and now he’s running a supplement brand. He’s also got a few courses out there in the marketplace teaching people how to grow their email lists and sell more on Shopify. 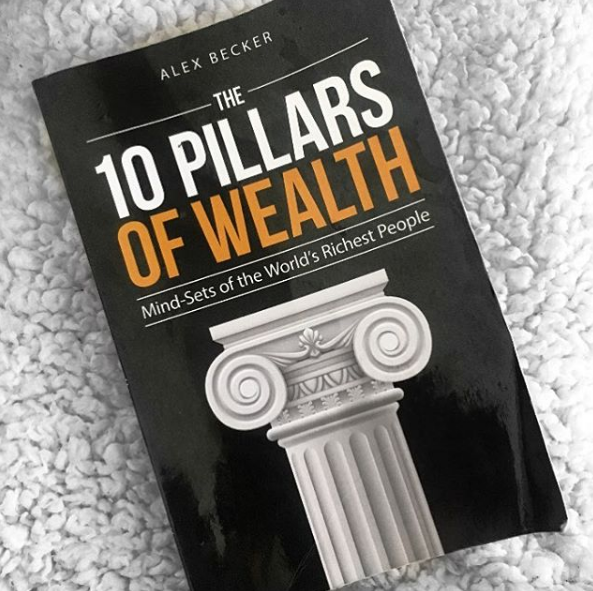 Alex Becker's book, "The 10 Pillars of Wealth". I have used a bunch of email autoresponder software over the years, including MadMimi and Drip. Drip has been my favorite up until I started using Market Hero. Drip allows you to do a lot of cool stuff, like track your open rates and tag your subscribers. But if you’re anything like me, while you care about open rates and click-through rates, the thing that matters most is SALES. Sales are the lifeblood of your business and sales is what puts cold, hard cash into your pocket. Market Hero helps you track sales, plain and simple. The best way for me to describe it is that all of the other email autoresponders were built for email marketers. I have nothing against email marketers and I send emails to my list on a daily basis, but their thinking has its limits. Market Hero was built BY a business owner FOR business owners. Market Hero is different because it gives you a bunch of different ways to help you track ROI and generate more profit from your emails. For example, one of the coolest features is that it shows you how much each lead is worth. Imagine logging into your email autoresponder and seeing that each lead is worth $6.87 to you. That means that you can go out and “buy” email addresses to make money. What you do is you buy paid traffic from Google, Facebook, etc. and send that traffic to an opt-in page. If you can get a successful opt-in for less money than it’s worth, you have a profitable business. Simply rinse and repeat as many times as you can. It also allows you to segment your list in much deeper ways than other autoresponder services out there. Like I said, I used Drip and they have some pretty decent segmentation tools, largely from the ability to apply tags to your leads, but it’s small potatoes compared to Market Hero. I don’t want to give away any of Market Hero’s proprietary information, but let’s just say that you will probably be impressed by the segmentation ability. As of the time of this writing, on Market Hero’s homepage, one of the headings you’ll see says, “4X Your Email Business With Unequaled Delivery and Sales Metrics”. This immediately set off my B.S. detector because I know how difficult it is to 4X an email sequence, especially if you’re any good at what you’re doing. However, Market Hero offers a free trial so I figured I would sign up and see if it was any good. I figured that I only need a small increase in sales for Market Hero to pay for itself and if it did 4X my business, I would be flying high. Now, in the interest of full disclosure I do want to tell you that Market Hero has NOT increased my sales 4X (yet), but I am getting more sales than before and Market Hero IS paying for itself. Rather easily, in fact. I was already doing well and had my email game tight, so I knew a 4X increase would be tough. I know I already mentioned this, but the key to Market Hero is how it keeps your customers’ lifetime value (LTV) in front of you at all times and it changes as you send out emails and tweak your autoresponder. Once you know your customer value, you can literally “buy” customers. What Market Hero does is actively track every sale and every conversion for every single lead on your list. It then averages everything together and gives you the stats you need to grow your business. If you were to do this manually, you would probably have to go through different softwares, various spreadsheets, and go back through your previous sales. You would have to crunch a lot of different numbers that you probably don’t even have anymore. Market Hero solves this problem better than anyone else on the market. Let’s say that I’m running two different opt-in campaigns for the same audience. Anyone who opts-in to the first campaign will be tagged as “A” and anyone who opts-in to the second campaign will be tagged as “B”. I can go into Market Hero and filter out all the “B” opt-ins and see how much they’re worth compared to “A” opt-ins. If I find out that the “B” opt-ins are making more money, I know that I should be pouring more ad dollars into advertising the “B” opt-in. And getting this up and running is super-easy too. All you have to do is take the pixel that Market Hero gives you and place it in the areas that you want to track. From there, Market Hero will keep tabs on all your customers, sales, conversions, etc. to give you the data that you need to grow your business. Inside Market Hero, there is a button called “integrations” that - you guessed it - helps you integrate with things like ClickFunnels, SamCart, Shopify, Leadpages, Zapier, and more. I think this is a smart move by Alex Becker because it shows that he knows his market. He knows that the people who are serious about making money online are probably using things like this and he wants to make sure that his software integrates seamlessly. My only complaint is that a lot of the software I use, such as OptinMonster and Thrive Themes has not been put in the “integrations” tab. That doesn’t mean you CAN’T integrate them, because you can (you use Zapier to make them talk to each other) but it’s not as easy as something like ClickFunnels or Shopify. When I started writing this Market Hero review, I was worried that it was going to lean a little too much towards Shopify entrepreneurs. That’s why I want to stress that Market Hero will help you in ANY online business, not just Shopify. On his YouTube channel, Alex has posted a lot of different videos about Shopify. Once you get past the clickbait-style titles, you find that he provides a lot of useful information on how to make money with Shopify. Part of the reason he does this is because he wants to get people to check out Market Hero because he knows it can help them with their Shopify business. For example, Market Hero allows you to create abandoned cart sequences. When someone starts the checkout process in Shopify (by entering their email) but doesn’t complete it, that gets tracked in Market Hero. From there, you can follow up with that person and get them back to complete their purchase. Depending on the study that you read, the average cart abandonment rate for an online store is usually somewhere in the neighborhood of 70-80%. Are there people with much lower abandonment rates? Sure, but this is the average. Imagine that you have 100 people go through your checkout process and 80 of those people abandon your cart. That means you have 20 customers and 80 non-customers. What if a cart recovery sequence only got a mere 10% of the non-customers to purchase? Market Hero also allows you to create upsell sequences. Can you create these sequences with other autoresponder softwares? Yes, you can. I’m completely transparent about that, but it’s nowhere near as fluid and it doesn’t give you that all-important lifetime customer value. The reason Market Hero is so powerful is because you can apply tags and track LTV. When you link Market Hero to Shopify, it starts tracking immediately. Purchase tags are applied that show you who bought which products. Imagine that you have a Shopify store selling print-on-demand dog shirts. If someone bought a pug shirt, it would be silly to try and sell Golden Retriever stuff to that person, right? But that’s what a lot of online entrepreneurs are doing because they don’t have the right data in front of them. Because Market Hero lets you see what the person bought, you can focus on selling only pug-related stuff to your pug customers. You can totally geek out on this stuff. You can get as detailed and as intricate as you like. In my own personal business, I use it to segment the topics that financial advisors are interested in. Because I sell products that help financial advisors GET clients and help them KEEP clients, if someone is more interested in KEEPING clients, I don’t want to bombard them with emails about GETTING clients, because they would be irrelevant. That person would eventually unsubscribe. Oh, and in case you’re interested, here’s a video of Alex Becker showing you how you can increase your Shopify sales 300% with Market Hero. Just keep in mind that Market Hero can be used with ANY online business, not just Shopify. From what I’ve seen, absolutely not. I think that at this point, Alex Becker has way too much to lose by being a scam artist. He’s running various businesses and he’s smart enough to realize that if he tarnished his reputation, he would be screwed. From what I’ve seen, people have complained about his refund policy. However, these people are usually the ones who have used Market Hero for months and try to get all their money back. These are the real scammers. If you aren’t willing to pay money for a service that can improve your business and your life, you’re scum. Plain and simple. While I didn’t have to use Market Hero support that much since everything is fairly self-explanatory, the few times that I did reach out to them, they got back to me pretty quickly. The support isn’t amazing to the point where they provide you with detailed step-by-step videos and hold your hand through every step of the way, but it isn’t terrible. Besides, if you need that level of coddling and hand-holding, perhaps Market Hero isn’t for you. Market Hero has English-speaking support staff available to answer your queries through live chat for free. You don’t have to be part of any special plan or upgraded package to have priority support, like some unscrupulous companies do. You just log in and start chatting. Market Hero is an awesome email software because it’s built for people who are trying to make money online. If you haven’t done so already, go over there, import your list and take advantage of the free trial. You can’t afford not to know your numbers for another month. That’s like driving blind. If you don’t know your numbers, you are leaving a tremendous amount of money on the table. Imagine how much more money you could make if you knew exactly what every lead was worth. How would that change your decisions? How would that change your life?